And you thought 2000 was bad. This year's election is shaping up to be one of the most controversial in history. Just this week, a federal judge ordered Ohio's top elections official to verify the identity of newly registered voters by matching them with other government documents. The very next day a 6th U.S. Circuit Court of Appeals set aside the federal judge's order on verifying registrations. Further igniting the voter fraud/voter registration debate was the news that a national community organizing group is being investigated in at least 14 states and several swing states for massive irregularities. This news would make headlines anyway, but what made it worse was that Barack Obama was a key player in this organization, the Association of Community Organizations for Reform Now, in the past. Obama trained its local leaders, represented the organization in court, and worked to funnel funds to the organization. The Obama campaign also donated $800,000 this year to an ACORN affiliate. The Association of Community Organizations for Reform Now (ACORN) is a community-based organization that advocates for low and moderate income families founded in 1970 by Wade Rathke and Gary Delgado. Rathke, one of the most powerful hard-Left activists in America, is a former member of a radical 1960s group, the Students for a Democratic Society (SDS). The Weathermen terrorist group split off from the SDS in 1969. ACORN says its priorities include better housing and wages for the poor, more community development investment from banks and governments, and better public schools. ACORN is also known for its voter registration efforts. This year alone ACORN has registered 1,315,037 voters. Although the organization prides itself for its registration efforts, it also has a long history of scandal. In the state of Missouri in 1986, 12 ACORN members were convicted of voter fraud. But that case was not an isolated incident in the state. In December 2004, in St. Louis, six volunteers pleaded guilty of dozens of election law violations for filling out registration cards with names of dead people and other bogus information. Authorities launched an earlier investigation after noticing that among the new voters was longtime St. Louis alderman Albert "Red" Villa, who died in 1990. The volunteers worked for "Operation Big Vote" -- a branch of ACORN -- in St. Louis. On February 10, 2005, Nonaresa Montgomery, a paid worker who ran Operation Big Vote during the run-up to the 2001 mayoral primary, was found guilty of vote fraud. Montgomery hired about 30 workers to do fraudulent voter-registration canvassing. Instead of knocking on doors, the volunteers sat at a St. Louis fast food restaurant and wrote out names and information from an outdated voter list. About 1,500 fraudulent voter registration cards were turned in. In October 2006, St. Louis election officials discovered at least 1,492 "potentially fraudulent" voter registration cards. They were all turned in by ACORN volunteers. In November 2006, 20,000 to 35,000 questionable voter registration forms were turned in by ACORN officials in Missouri. Most all of these were from St. Louis and Kansas City areas, where ACORN purportedly sought to help empower the "disenfranchised" minorities living there. But the ACORN workers weren't just told to register new voters. The workers admitted on camera that they were coached to tell registrants to vote for Democrat Claire McCaskill. In 2007, in Kansas City, Missouri, four ACORN employees were indicted for fraud. In April of this year eight ACORN employees in St. Louis city and county pleaded guilty to federal election fraud for submitting bogus voter registrations. And, that was just Missouri. North Carolina -- State Board of Elections officials have found at least 100 voter registration forms with the same names over and over again. The forms were turned in by ACORN. Officials sent about 30 applications to the state Board of Elections for possible fraud investigation. Ohio -- The New York Post reported that a Cleveland man said he was given cash and cigarettes by aggressive ACORN activists in exchange for registering an astonishing 72 times. The complaints have sparked an investigation by election officials into the organization, whose political wing has supported Barack Obama. Witnesses have already been subpoenaed to testify against the organization. Nevada -- Authorities raided the headquarters of the Association of Community Organizations for Reform Now on Tuesday October 7, 2008, after a month-long investigation. The fraudulent voter registrations included the Dallas Cowboys starting line-up. Indiana -- More than 2,000 voter registration forms filed in northern Indiana's Lake County filled out by ACORN employees turned out to be bogus. Officials also stopped processing a stack of about 5,000 applications delivered just before the October 6 registration deadline after the first 2,100 turned out to be phony. Connecticut -- Officials are looking into a complaint alleging ACORN submitted fraudulent voter registration cards in Bridgeport. In one instance, an official said a card was filled out for a 7-year-old girl, whose age was listed as 27. 8,000 cards were submitted in Bridgeport. Missouri -- The Kansas City election board is reporting 100 duplicate applications and 280 with fake information. Acorn officials agreed that at least 4% of their registrations were bogus. Governor Matt Blunt condemned the attempts by ACORN to commit voter fraud. Pennsylvania -- Officials are investigating suspicious or incomplete registration forms submitted by ACORN. 252,595 voter registrations were submitted in Philadelphia. Remarkably, 57,435 were rejected -- most of them submitted by ACORN. Wisconsin -- In Milwaukee ACORN improperly used felons as registration workers. Additionally, its workers are among 49 cases of bad registrations sent to authorities for possible charges, as first reported by the Journal Sentinel. Florida -- The Pinellas County Elections supervisor says his office has received around 35 voter registrations that appear to be bogus. There is also a question of 30,000 felons who are registered illegally to vote. Their connections with ACORN are not yet clear. Texas -- Of the 30,000 registration cards ACORN turned in, Harris County tax assessor Paul Bettencourt says just more than 20,000 are valid. 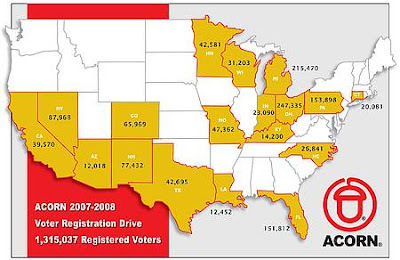 And just look at some of the places ACORN was finding those voters. A church just next door is the address for around 150 people. More than 250 people claim a homeless outreach center as their home address. Some listed a county mental health facility as their home and one person even wrote down the Harris County jail at the sheriff's office. Michigan -- ACORN in Detroit is being investigated after several municipal clerks reported fraudulent and duplicate voter registration applications coming through. The clerk interviewed said the fraud appears to be widespread. New Mexico -- The Bernalillo County clerk has notified prosecutors that some 1,100 fraudulent voter registration cards were turned in by ACORN. That's not all. So far this year at least 14 states have started investigations against ACORN. Talk about a culture of corruption. It is so bad that Representatives of Congress have asked for the Justice Department to investigate, and GOP presidential candidate John McCain is bringing it up in his stump speeches. The Obama camp is stealthily altering its "Fight the Smears" website to distance themselves from the organization -- quite a challenge considering how close their candidate's association has been with the group. The liberal vs. conservative, voter fraud vs. voter intimidation debate will no doubt continue after this election. But this year, with the assistance of scandal-plagued ACORN, it appears that -- so far -- the voter fraud side is winning.